Are you considering Coach Training but not sure where to start? There's so many options with different schools, programs, certifications and pathways. We asked our community what criteria they used when choosing their school and then packaged it up into a quick checklist that might be useful for you. Let us know if you have any specific questions. A question we regularly get asked by prospective students is 'What makes ICA different from other schools?' This is a totally understandable question because coach training is an investment of both time and money and it's important your decision is one that will fit your budget, learning style and plans for coaching. We also know that there's alot of information, (and very detailed information) you need to wade through and consider before finding a solution. So, we've pulled out what we believe are the key points of difference between ICA and other schools or training. We've also compiled a list of questions you should ask any coaching school before you enrol. International Coach Academy (ICA) was created in the year 2000 with a vision to create a vibrant global community of coaches. We were the very first Australian based school to have their e-learning accredited by the ICF. We are grateful to the first intake of 20 students who trusted our vision, values, leadership and expertise. Fast forward to today and ICA is a thriving and diverse community of coaches in 92 different countries around the world, offering CCE, ACSTH and ACTP training. We assume that everyone who comes to coaching has a wealth of experience, knowledge or interest. Our job is to provide you with a curriculum that is challenging and engaging and then to help you figure out the questions you need to answer and the learning you need to develop as a coach. Our graduates are confident and unique coaches, who create positive change in the world on a daily basis. Not all coaches need or want an ICF Credential, but we would highly recommend that all coaches become certified. So, what is the difference? - The ICF were, and continue to be the most established peak body in coaching worldwide. With chapters in many countries around the world they offer the most “global” service to date. - Coaching is a global clients from any country in the world. Provided they speak the same language and can learn how to use www.timeanddate.com there is no reason to service only a smaller, local market. Our programs offer CCE, ACSTH and ACTP Certification, with pathways to the ACC and PCC credentials. The coaching market is saturated with cookie cutter coaches - all learning the same old models (GROW model etc.) and then coaching with the same old processes. At ICA we help you to create a coaching model that is unique to you. Our Coach Discovery course area is designed to match your interests and passions to your coaching by looking at who you want to coach, where you want to coach, and who you want to be as a coach. Every student at ICA graduates with their own unique coaching model. We don't just teach - we specialise in the application of knowledge. Our training will equip you with the necessary skill to coach anyone, anywhere in the world. Even people in professions other than yours. We then encourage you to specialise with a coaching niche and support you to do that in our Discovery Labs. Because our training is virtual, you get to build relationships and friendships with like minded coaches from all around the world. Your not limited by physical location. Our coaching community is rich with diversity, with coaches in over 92 different countries who meet regularly in person (F2F Meet ups), in their classrooms (zoom) or in the community forum. There's a strong sense of camaraderie, with many of our graduates continuing their connections long after they complete their coach training. Many coach training schools charge extra for peer coaching - but with ICA, it's included. This gives you the chance to practice as both a coach and a client, and gives you the peer coaching requirements for an ACC or PCC credential. ICA's faculty is at the heart of ICA's learning delivery. Many have worked with ICA for over 10 years and all are active coaches with professional practices or an industry presence. All are either an ACC, PCC or MCC credentialed coach and are certified trainers with shared standards of excellence and a commitment to learning. But, it's more than just a teacher / student relationship. Our faculty are invested in the success of our learners and in the future of coaching. They are available outside the classroom via the community forum and regularly attend our community F2F meet ups. It's a common misconception that the price of something represents it's value. But, actually, its the inclusions of something and the value they represents for you that are the indicator of their true value. 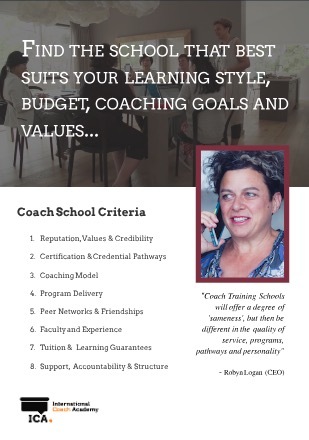 We have been really careful when packaging up our programs and made sure that they include everything a coach would need if they were wanting to set up their coaching practice, add coaching to their existing profession, or become a corporate coach. This includes being sure that our programs offer direct pathways to ICF credentials via the ACSTH or ACTP track. At ICA the term all inclusive means - no hidden costs, no unexpected certification hurdles, and full access to our coaching community. We also offer a 45 day learning guarantee where you get to be sure that our training is for you. We make our coach training as flexible as possible and believe it or not, we do this with structures. So, we put the schedule and learning in place so that there's a path you can follow. But, then we extend the flexibility for you to customise this as you need. You choose when you learn. Whatever your commitments are, the great thing about our classes is that you can always find a way to fit them into your schedule. And if you miss a class it doesn’t matter, just pick it up the week after.